Photo by James Willamor via Creative Commons. Tailgating has come a long way since November 6, 1869, when spectators lowered the buckboards (tailgates) of their horse-drawn wagons to serve picnic lunches from hampers at the first intercollegiate football game, Princeton vs. Rutgers. Today, the real competition’s on the asphalt, not the AstroTurf. 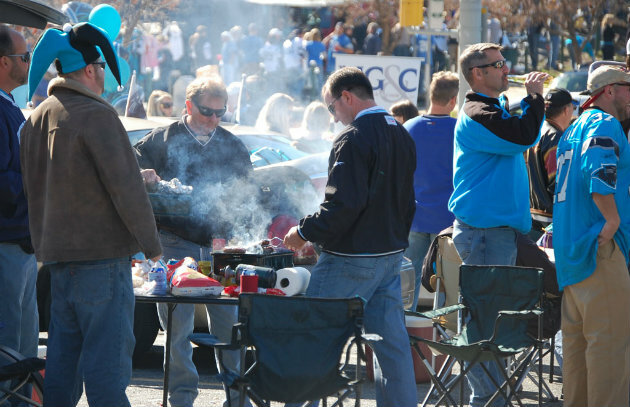 Americans are obsessed with tailgating, especially during football season. And if we didn’t inherit legacy sideline tickets or stadium parking passes, no problem. We’ll just host a party at home with epic seats, beats, and eats. If you’re a frequent tailgater, develop a master list/check-off system and laminate it. (Be sure to include “tickets” and “parking pass”!) You can’t retrieve a forgotten item once you’ve parked and set up at the venue. Strategically pack your vehicle from front to back with the items you’ll want first near the rear. Ideally, you’ll own duplicates of critical grilling equipment—tongs, grill gloves, chimney starters, etc.—so you don’t have to cannibalize your home collection every time you host an off-site tailgating party. (We’ll cover tailgating gear in a future post.) Store in a multi-drawer toolbox or clear plastic bin. Assess your resources before you develop your guest list and menu. Most portable grills are relatively small (we’ll share our favorites in an upcoming post); many have less than 150 square inches of cooking space versus 363 square inches on a standard 22-inch kettle grill. These compact units are best for direct grilling foods that take 30 minutes or less to cook; they aren’t well suited to indirect grilling. Our advice? 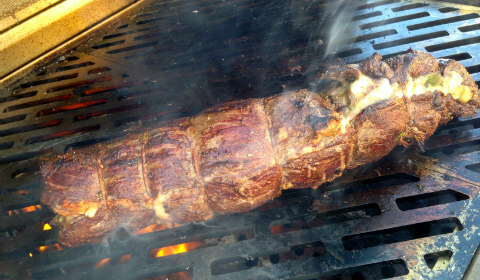 Practice using your tailgating grill at home when the stakes aren’t so high. Decide for yourself what it’s realistically capable of, then determine if you need a larger grill, or perhaps a second grill in your tailgating arsenal. 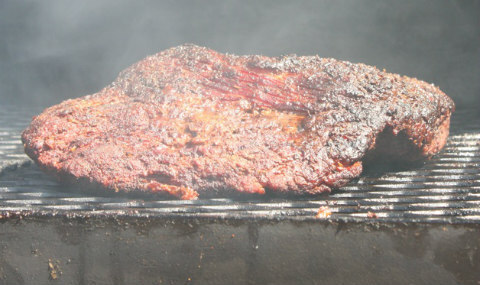 Alternatively, you can build your menu around a large hunk of meat, such as brisket or pork shoulder, that you smoke or barbecue at home and bring to the party for reheating. 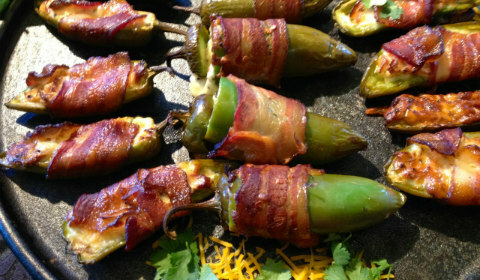 Foods that can be eaten out of hand work best for tailgating. You know what we’re talking about: chicken wings, jalapeño poppers, nachos, or bruschetta. For the main event, think tacos or fajitas; pulled pork sandwiches; hamburgers or sliders; sausage subs; brats; kebabs; burritos; chicken or turkey legs; individual beef or pork ribs; cheesesteak sandwiches; you get the picture. Carry the portable theme into the dessert course as well: everyone loves s’mores. A restaurant supply house is a great source for disposable foil pans, which are indispensible for transporting and reheating foods carried from home. While you’re there, pick up some beverage and take-out containers—handy for packing leftovers—plastic cutlery, and sturdy garbage bags. Accept offers from your guests to contribute a dish to the meal. This invests them in your party and takes some of the burden of entertaining off you. Bring more fuel than you think you’ll need. If burning charcoal, be prepared to douse and safely dispose of the ashes. (Do not leave any lit grill or live coals unattended.) Transport propane tanks, which tend to be tippy, in plastic milk crates. If the party’s in a parking lot or infield, let guests know where to find you. Make sure they have your cell phone number. A conspicuous helium balloon on a long tether helps. Confirm tailgating regulations and protocol at the venue well in advance of the party (these are often posted online). They can change from year to year. Welcome guests with a beverage when they arrive. 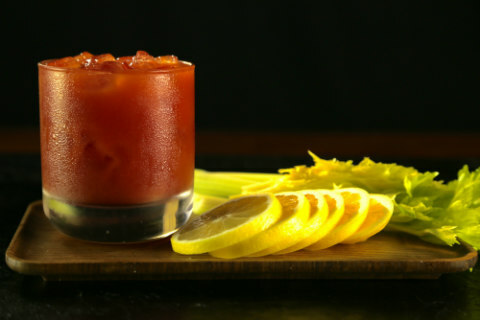 We’re partial to Smoky Marys. Strips of homemade Sriracha Beef Jerky make great swizzle sticks. And don’t forget nonalcoholic options, especially bottled water. (Experienced tailgaters freeze bottles of water and use in lieu of loose ice in their coolers.) Keep cold beverages in a separate cooler (not the one you use for perishable foods) and tie a bottle opener to one of the handles. Smoky Mary. Photo by Richard Dallett. Get more recipes in Raichlen’s Tailgating! ebook.